Why does the modern Shmita occur three years before the Shmita of 2017t to 2018? Therefore there runs two parallel seven-year cycles, separated by three years. Jews today follow the cycle that began at the return of the exile led by Ezra (and Nehemiah), but God also still keeps track of the original one because of its eternal prophetic importance. Why is the 70th jubilee (2024t to 2025) important? Because God graciously delayed judgment 15 years, from 2010 to 2025, just as He did for King Hezekiah. (I spoke about this delay in detail back in 2009.) This delay was accompanied by a sign to do with the Sun back then, too, (Isa. 38:5-8). “Five” is the number of grace. Therefore, “15 years” is 5*3, ‘grace’ ‘competed’. Hezekiah died at 55 years of age. For example, from the Creation of Adam, 4115t BC (see note at end of article), unto AD 2010, are 5*5*5 jubilees; but because there are 70 jubilees from Creation to the death of Hezekiah, this means that from Hezekiah’s death in 686 BC, to 2010 are 55 jubilees. (5*5*5 = 125 and 125 = 70+55.) Also, from when Israel entered Egypt in 1876 BC to 2010 are 555*7 yrs, which is the same as 1260+1290+1335 yrs. This 15-year delay was explained back in 2009. Moreover, on the Jewish calendar, 2010-2017 are the years 5770-5777, etc. That’s why the Stock Market did not completely crash in 2015! That’s why Trump! It’s all about ‘delay’ – until the cup of the Amorites is full. (Gen 15:16) And whose to say that He won’t delay again? “… and [he] swore by him who lives forever and ever… that there would be no more delay, but that in the days of the trumpet call to be sounded by the seventh angel, the mystery of God would be fulfilled, (Rev. 10:6-7). Unlike lunar eclipses (except for the Passover-Tabernacle tetrad lunar eclipses of 2014-2015), total solar eclipses are rare. The last time America had one was 26 years ago. God has used solar eclipses as signs before. The following is lengthy — but extremely important. It shows that God has used eclipses in the past to communicate His plans and can be expected to do so again. Jesus said, “And there shall be signs in the sun, and in the moon, and in the stars” (Luke 21:25). Around July of 1406 BC, the same year the jubilee count begins, Joshua commanded the sun and moon to stand still while Israel defeated the Amorites, (Josh 10:12). 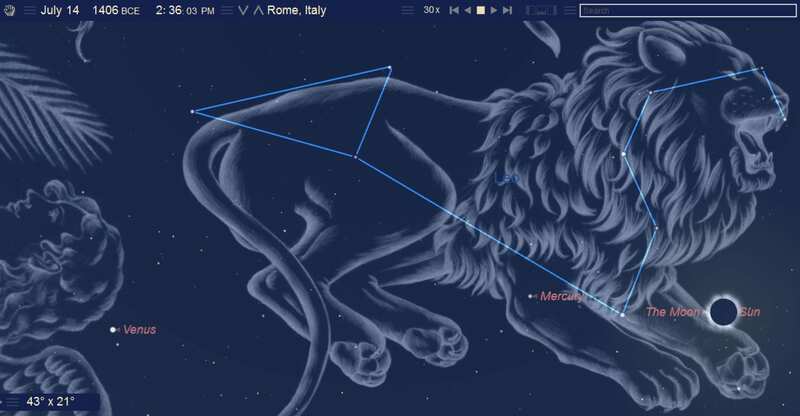 However, there was another celestial sign left unrecorded that occurred about the same time. 1406 BC, July 14. Total Solar Eclipse as seen from Rome . Aug 21, 2017. Total Solar Eclipse as seen from Salem, US. 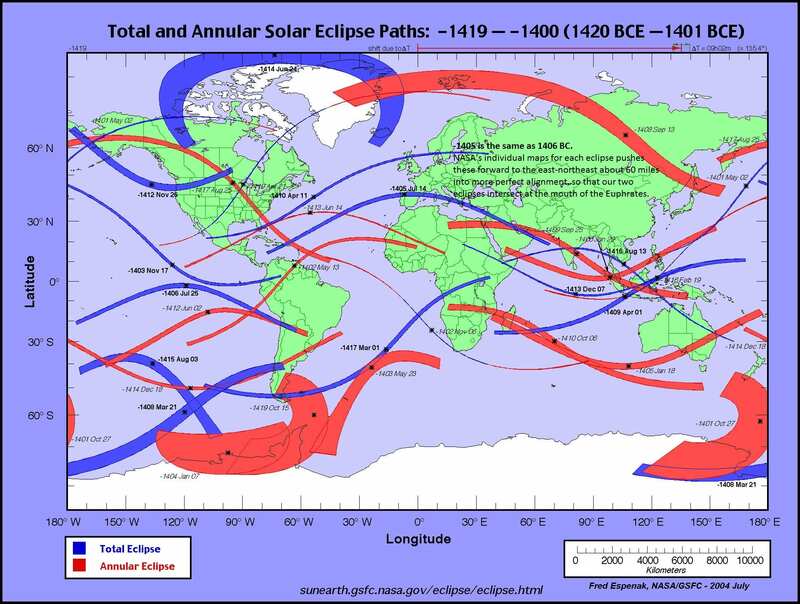 Thus, the 1406 BC eclipse is the same location as our 2017 eclipse. To understand the eclipse at the start of the jubilees is to understand the 2017 eclipse at the end, nearly 70 jubilees later. Therefore, ponder the following carefully! Moses prophesied the day he died “at 120 years of age” (i.e., 120.5) concerning the future of the 12 tribes of Israel. That day happened to have been exactly six months before the July 14, 1406 eclipse, (Deut 1:3; 34:7-8). Moreover, there just happened to have been an annular eclipse occurring elsewhere in the world on this very day! On this same day, Moses prophesied about two tribes in particular that when overlapped like the sun and moon foretold the eclipse of July 14, 1406 BC… The tribes of Dan and Manasseh (Joseph). (Manasseh inherited Mt Hermon of Bashan, the land of the Giants, [Deut 3:11; Jos 12:4; 13:12; Num 32:33]. Dan leaped toward that direction and later relocated near there. The book of Enoch [and other sources] inform us that Mt Hermon is where the angels “sons of God” descended from “heaven”, Gen 6:2, but were judged and sent to the “deep”. 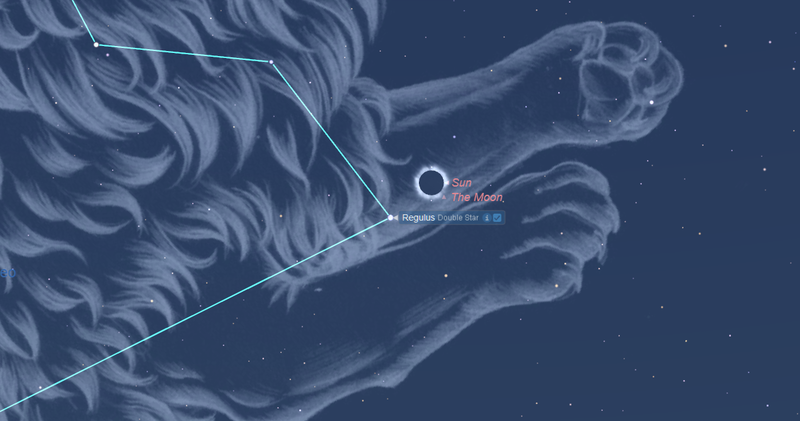 Recall that this eclipse occurred in the heavens where the crouching lion (Leo) leaps upon the prey of the “sun” and “moon” overlapped by the eclipse. Compare all this to the key elements of the prophecy to Joseph and Dan. “And of Dan he said, “Dan is a lion’s cub that leaps from Bashan.”(Deut 33:14,22). Yet another total solar eclipse occurred 40 years earlier on the very day that God said, “This month to you will be the first of the month”. This was the very New Year inaugurated by Moses at the Exodus (1446n). (As with the 360- calendar, there may have been a leap-month that year, if so, then the eclipse fell on 2Adar). This total solar eclipse passed over the source of the Nile River (recall the first plague), at Lake Victoria, and was thus visible from Upper Egypt. Moreover, the Exodus eclipse occurred at the bands of Pisces (Fishes), next to the women in chains (Andromeda). The bands of Pisces have long symbolized the slavery of Israel in Egypt. 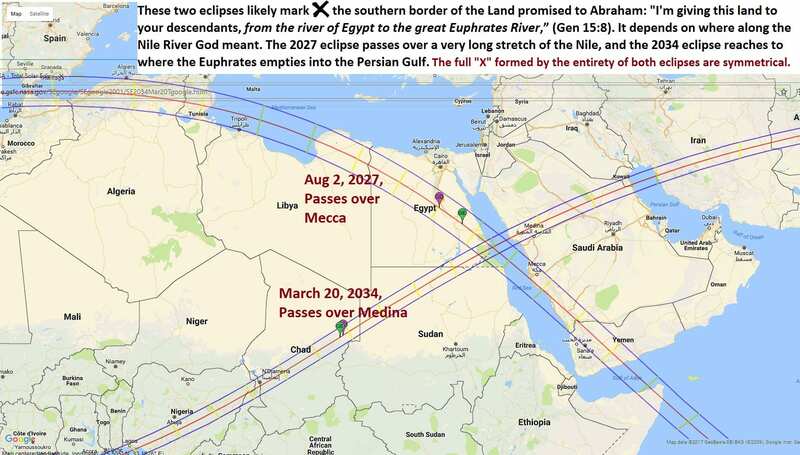 This eclipse on the New Year of the Exodus was also likely at, or very near the same time God that supernaturally brought “darkness over all the land of Egypt three days”, (Ex 10:21-23). (It was the 9th plague, and thus about two weeks before the Exodus, Ex 11:8-12:3). Six months before this total solar eclipse, which is when the plagues upon Egypt began, there was an annular solar eclipse over southern Africa. Thus, the six (or 7) months of the ten plagues began and ended with a solar eclipse in Africa; the first one upon the former autumn New Year, and the second one upon the newly commanded spring New Year! “I’ll execute judgments on all the gods of Egypt. I am the LORD,” (Exod 12:12). (Click to enlarge.) God marks an “X” over the southern boundary promised to Abraham that reaches along the Nile River to the Euphrates, while blotting out Mecca and Medina. The 2017 total solar eclipse over America has similar meaning. To many, North America is the equivalent of the Promised Land. As a matter of fact, the very day Columbus left port and discovered America, Jews were exiled from Spain. God claims America as His. This eclipse divides America in half, and symbolizes a divided nation. (Isn’t this what America has become politically? )“Mene, Mene, Tekel, Uparsin”, “…your kingdom is divided…” (Dan 5). (From the fall of Babylon in 539t BC, unto 2017t are 2555 years. (A solar year is 365 days, and “2555” equals 7 x 365, and therefore is also in alignment with the Shmitas). The first major city that the eclipse passes through is Salem, Oregon, which is another name for Jerusalem, meaning “Peace”. Peace is removed from America.“In Salem also is his tabernacle, and his dwelling place in Zion… At thy rebuke, O God of Jacob, both the chariot and horse are cast into a dead sleep… Thou didst cause judgment to be heard from heaven”, (Psalm 76:2,6,8). Salem is therefore symbolic of Jerusalem. Salem was visited by another total solar eclipse exactly 38.5 years ago. It is very rare for a city to be visited by two total solar eclipses within 40 years. But the 39 years between these two eclipses means that 1979 (Feb.) was 70 jubilees (less seven years) from when God intended Israel to enter the Promised Land, that is, from when they left Mt Sinai one year after the Exodus, (1446/5 BC). Thus God highlights Salem as a simply play on words to remind us that North America was dedicated to God just as Jeru’salem’ and the real Promised Land was back in 1406 BC. Both 1492-3 (when America was discovered, i.e., “The New Promised Land”), and 1947-8 (when Israel returned to the actual Promised Land) are Shmita years (65*7 apart). And from 1492 to the Salem eclipse of 1979-1986 is one-seventh of the full 490*7 from the Exodus, accounting for the missed Shimitas. And from 1492t to 2024t are 76 missed Shmitas, which in turn span from 1948-2024. And from 1948 to 2025 are 77 years, and thus 11 missed Sabbaths back to 2014t. This creates a narrowing residual effect like birth pangs, thereby reversing the effects of Leviticus 26:18. Thus, 1492, 1948 and 2014 are all starting points for birth pangs — counting down to the final two years of jubilee (2024t-2026t). Moreover, each of these starting points were marked by rare Passover/Tabernacles Tetrad Lunar Eclipses. (Click to enlarge.) All Tetrad Lunar Eclipses that land on Passover and Tabernacles up to the present time. In other words, God is counting missed Shmitas from 1492, just as He did for Israel of old from 1445/1406 BC, (Lev 26:34; 2Chr 36:21; Jer 34:17). The two “Promised Lands” (1406 BC and 1492 AD) are synchronized by one-seventh in the same way that the 1000-year reign of Christ’s (Sabbath-Rest) on earth when He returns will be one-seventh the total years from Creation. (Rounded: 6000 + 1000 = 7000 years. Notice that 3430/3500 yrs are also in synchronicity.) Thus, just as Israel went into captivity according to the years they missed their Sabbaths, so will North America. (We will explain all this in detail later.) Like Babylon of old (539 BC), the fall of the one will mark the restoration of the other. All numeric patterns in the bible are self-similar because they are a fractal. 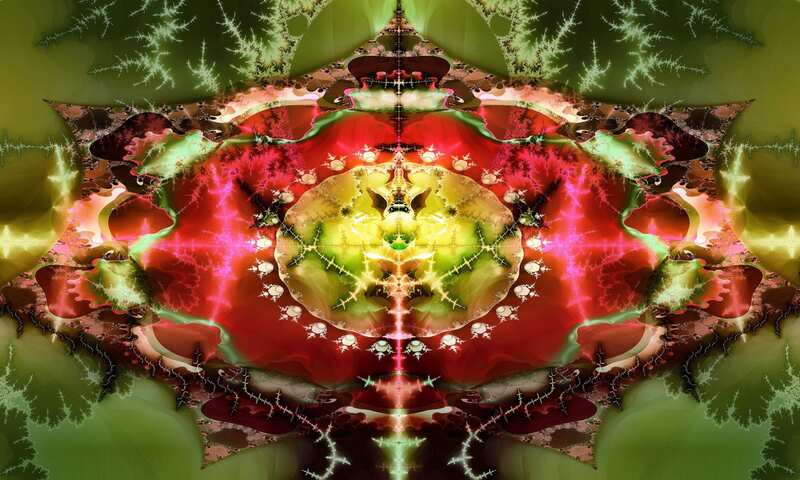 The first image on the home page of 1260d.com is a small part of this massive fractal, created by these jubilees. It is my joy to eventually explain all this in future blogs. “I must work the works of him that sent me, while it is day: the night cometh, when no man can work. As long as I am in the world, I am the light (Sun) of the world,” (John 9:4-5). “At the end of every seven years, in the set time of the year of release, in the feast of tabernacles, …read this law before all Israel,” (Deut 31:10-11). Exactly one month after the 2017 eclipse is the regular Jewish New Year – the official start of the 490th seven-year cycle. Below is a sample of the things we will discuss. (Click to enlarge.) How God marked an “X” over the southern boundary promised to Abraham that reaches along the Nile River to the Euphrates, while blotting out Mecca and Medina.